The last "Indian War" was fought against Native American children in the dormitories and classrooms of government boarding schools. Only by removing Indian children from their homes for extended periods of time, policymakers reasoned, could white "civilization" take root while childhood memories of "savagism" gradually faded to the point of extinction. In the words of one official: "Kill the Indian and save the man." Education for Extinction offers the first comprehensive account of this dispiriting effort. Much more than a study of federal Indian policy, this book vividly details the day-to-day experiences of Indian youth living in a "total institution" designed to reconstruct them both psychologically and culturally. The assault on identity came in many forms: the shearing off of braids, the assignment of new names, uniformed drill routines, humiliating punishments, relentless attacks on native religious beliefs, patriotic indoctrinations, suppression of tribal languages, Victorian gender rituals, football contests, and industrial training. Especially poignant is Adams's description of the ways in which students resisted or accommodated themselves to forced assimilation. Many converted to varying degrees, but others plotted escapes, committed arson, and devised ingenious strategies of passive resistance. Adams also argues that many of those who seemingly cooperated with the system were more than passive players in this drama, that the response of accommodation was not synonymous with cultural surrender. This is especially apparent in his analysis of students who returned to the reservation. He reveals the various ways in which graduates struggled to make sense of their lives and selectively drew upon their school experience in negotiating personal and tribal survival in a world increasingly dominated by white men. 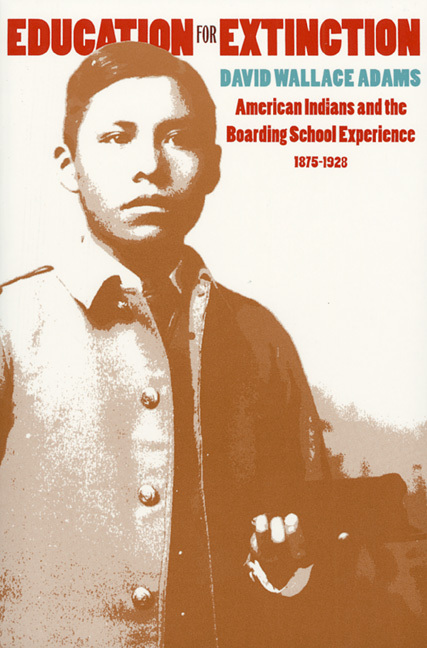 Based upon extensive use of government archives, Indian and teacher autobiographies, and school newspapers, Adams's moving account is essential reading for scholars and general readers alike interested in Western history, Native American studies, American race relations, education history, and multiculturalism. David Adams is associate professor of education at Cleveland State University and the author of chapters in Leonard Dinnerstein and Kenneth Jackson’s American Vistas: 1877 to the Present and Philip Weeks’s Native American Experience.